Believe me when I tell you that I’m knocking on wood as I say type this…I think we are finally on the mend. Friday while I struggled through my work day Andy had the girls. He did all the laundry. Then when I got home that night, he handled making dinner and he put rylee to bed. Saturday I barely left the couch. Andy took care of the girls, finished the laundry, went grocery shopping and handled bedtime again. Sunday I bummed around yet again while Andy took care of the girls. During naps that day we got some quiet time to just sit on the couch together and veg. That never happens. It’s amazing what just a couple hours of quiet time together can do for your soul, ammiright!? Neither of the girls had a decent nap. 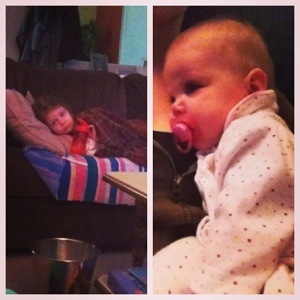 In fact, Ry didn’t nap at all…what child stays home actually sick from school and doesn’t nap!? Reese napped, but only for about 20-25 minutes at a time. I didn’t shower. We watched movies and/or tv all day long and I don’t feel the least bit guilty about it. At one point I actually watched Reese poop so bad I saw it bubble up out the top of her diaper, down the back of her pants and puddle on the carpet. Then Andy worked late because being the awesome dad/husband he is, he stayed home with the girls on Wednesday so he had plan for a sub. It was a helluva day and I was thankful that Andy took care of things yesterday because I’m not sure I would have been able to handle another day like that. I got home last night, the kids had napped, he had showered and they were all hanging out and happy. Which always leads me to wonder how does he do it!? That man is amazing and I swear he is a better mother than I am. Tonight we have to drop the suburban off at the mechanics. So instead of trying to do that and come home and make dinner, we’re going to eat out. We rarely eat out. Especially on a weeknight and definitely not since Reese has started eating dinner at the same time we do. I’m almost getting anxiety just thinking about it. Haha. Kidding. I am so happy today is Thursday! That means tomorrow is Friday! Here’s to a weekend where no one is sick! Ok that whole thing was really random, but really…how does Andy make it all look so easy!? This entry was posted in family, Super Dad on January 31, 2013 by katherine.